Pittsburgh Post-Gazette: "The performance demonstrated the violinist's virtuosity, as well as his ability to forgo it for the sake of stirring lyricism." Pittsburgh Tribune-Review: "Violinist Stefan Jackiw quickly established Friday night why he has been a sought-after soloist since he was 12." 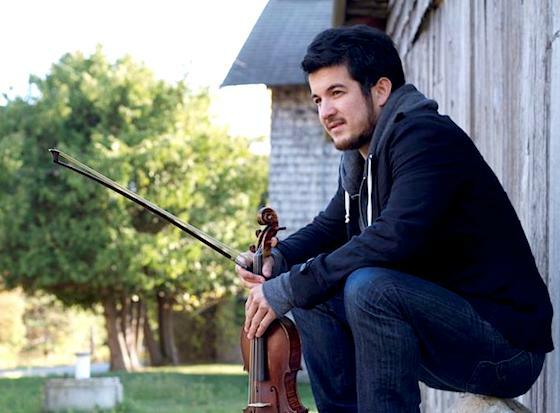 Cape Cod Times: "The emotional showpiece of the…concert was certainly (Chris) Brubeck's "Spontaneous Combustion," a jam-session violin concerto written for firebrand fiddler Nicolas Kendall." Boston Globe: "Nosky and violinist Christina Day Martinson took up the solo parts with vigor and ample technique but not always a palpably shared or complementary interpretive vision." Boston Classical Review: "The constant intertwining of lines in the string orchestra and between the two soloists on Friday was a puzzle to the listener’s ear and the night’s severest test of playing together without a conductor." Portland Press Herald: "Every voice was so clearly stated that one could follow Bach’s polyphonic structure perfectly, wondering at the same time about the mind of a man who could improvise a five-part fugue for Frederick the Great after traveling all day in a post-chaise." Milwaukee Journal Sentinel: "Josefowicz played with a spot-on blend of fire and control, delivering even the most jaw-dropping technical passages with complete command." The Sydney Morning Herald: "Kristian Winther gave a fine account fronting Rautavaara's Violin Concerto, an excellent display piece through a juxtaposition of bravura and cantabile passages, with the performer's own cadenza interpolated." Limelight Magazine: "His Violin Concerto featured Australian soloist Kristian Winther, whose energy and ferocity was well utilised in this performance." St. Louis Post Dispatch: "Tetzlaff was phenomenal, performing in a manner that had to be seen as well as heard in order to be believed. His technique is astonishing, as is his stamina, in a work that runs three-quarters of an hour and keeps its soloist hopping for most of that time." The New Zealand Herald: "Ovrutsky was an agile and musicianly player. He clearly enjoyed the runaway romp of Korngold's Finale but too often a more lustrous tone would have given this luscious music the glow it needs." Herald Scotland: "The steely and sinewy soundscape of the opening set the scene for this well honed yet vital performance. (Conductor Andris) Nelsons made a great job of balancing the orchestral forces with this eloquent soloist."